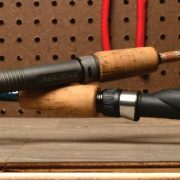 When it comes to handle assemblies, cork has long been a popular grip material known to bring a traditional look and feel to any fishing rod. The biggest knock on cork is its tendency to erode, slough, and chip over time however, all these factors can be deterred with the application of U-40 Cork Seal. Cork Handles look great whether they are traditional or take on something more inventive like a cork checkerboard handle, but either way, protecting the cork’s surface is crucial to preserving its look and lifespan. U-40 Cork Seal is the ultimate protector of cork because it seals the surface and maintains the natural look while also enhancing the grip. 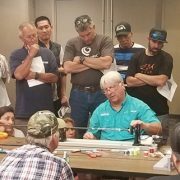 While fishing, cork handles encounter all sorts damaging contaminants. 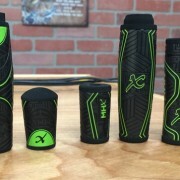 From mud and fish guts to the oils on our own hands, cork grips are regularly exposed to harmful materials in the fishing environment that in turn cause the cork’s structure to deteriorate. 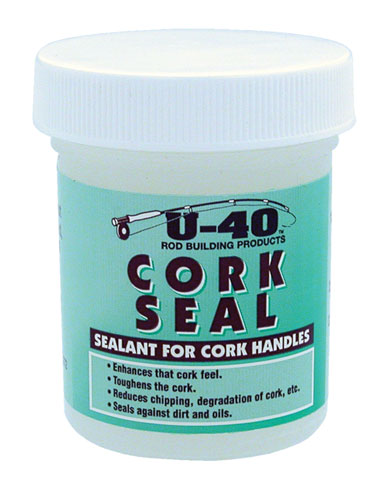 U-40 Cork Seal comes in 2-oz containers. Sealing the cork’s surface with u-40 Cork Seal goes a long way to preserve both its natural look and feel. Soaking into the cork to prevent any oil, mud, water, fish guts or eggs from penetrating its semi-porous structure, U-40 Cork Seal will defend your cork handle and look great doing it. Although U-40 Cork Seal won’t protect a cork handle from your dog’s teeth, it does work wonders to reduce the potential of any sloughing or chipping from the cork’s surface. 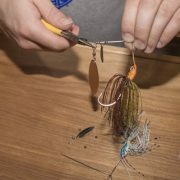 Cork handles are often tarnished when knocked around during the packing, transporting, and fishing phase of a trip so some added protection is a huge benefit. Cork’s semi-porous structure accounts for the lightweight grip material fisherman love, but unfortunately, it also causes the cork to be easily soiled resulting in gradual deterioration. 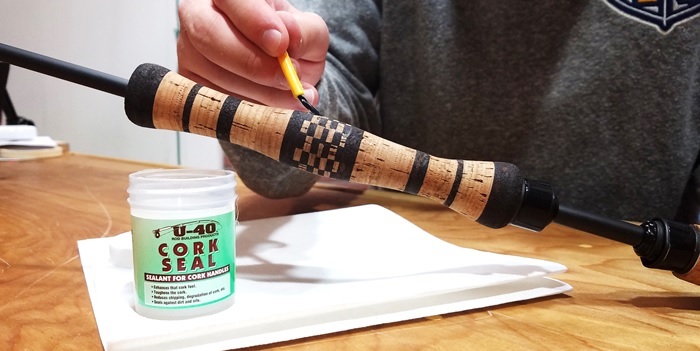 Providing a protective layer between the cork and its environment, U-40 Cork Seal keeps the handle clean and intact whether you are out on the water or just storing your rod. Considering it helps to prevent any added material from entering the cork, U-40 Cork Seal also enhances the cork feel of the handle by prolonging its initial natural grip. U-40 Cork Seal captures the initial grip of the cork allowing it to return to peak performance each time afterwards. The ultimate protector of cork, U-40 Cork Seal takes only one coat to seal the cork’s surface and protect the cork’s natural look and grip. Using some warm—lightly soapy—water and a sponge, gently rub the soapy sponge over the cork grip. For problem areas, use a little more pressure with the sponge. Once satisfied, rinse the cork with plain water to remove all the soapy residual. With all the soap suds removed, leave the cork out to dry. Make sure the cork is completely dry before moving on to applying the U-40 Cork Seal. Next, apply U-40 Cork Seal to the dry cork’s surface with a bristle brush to ensure you cover the entire surface. Use the brush to wipe away any excess that will not soak in to prevent the U-40 Cork Seal from sagging, streaking or running. 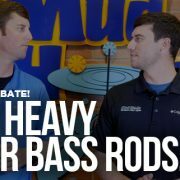 It is important to only apply one coat considering the second coat will not penetrate the first. After the cork is completely covered and all the excess is removed, clean the brush right away in running tap water. Then, let the sealed cork cure. It will be dry to the touch in 30 minutes and ready to use in only 24 hours. 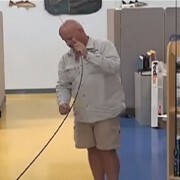 Once 24 hours pass, get back on the water with your sealed cork handle that can now outlast the elements of fishing to look and feel brand new every time. With the application of U-40 Cork Seal, your cork will look, feel, and fish as genuine as its first day on the water. Check out U-40 Cork Seal now to preserve your cork handles.